EA's CEO calls pushing a subscription model in a largely free-to-play market "challenging." Talking to CNBC at Fortune's Brainstorm Tech conference in Aspen, CEO John Riccitiello confirmed that EA is looking into "different models to bring more users into [The Old Republic]," but he stopped short of substantiating rumors that the game may be going entirely free-to-play. "Our conclusion was we had a great product in Star Wars, but that the subscription model in the world of free-to-play was challenging," he said. 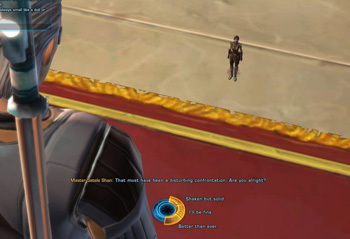 The Old Republic has already partially embraced the free-to-play model. The game recently started offering extended free trials which let aspiring Sith lords play up to level 15, a move many critics have been quick to label a grim portent of the game's impending implosion. News that the The Old Republic has been shedding subscribers by the thousands, developer, BioWare, has been laying off staff and numerous key figures have walked away from the studio have done little to allay rumors that the game may have to go free-to-play. Riccitiello also claimed that investors are relying too heavily on monthly NPD reports to gauge EA's performance. He pointed out that NPD's reports only track retail sales in the US and don't take into account EA's blossoming digital business.